We are thrilled to host a unique wine dinner on Thursday, February 22 offering guests a rare opportunity to taste through 10 vintages from Tuscan winemaker and owner Massimo Piccin of Podere Sapaio. Chef Staffan will prepare a four-course dinner to pair with the featured wines listed below. The evening will begin at 6pm with a bubbly reception, followed by dinner at 6:30pm. This extraordinary experience will be $180 per person, excluding tax + gratuity. 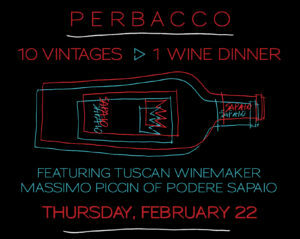 To make plans to join Massimo Piccin for the evening, call (415) 955-0647 or reply to this email. Located in the Bolgheri area of Tuscany, Massimo Piccin founded Podere Sapaio in 1999 with the intent to experiment, innovate, and create wines that were strong, elegant and long lasting at the same time. The winery is now producing world class Bordeaux-style blends that have received international acclaim. Podere Sapaio is located on a picturesque 100 acre estate with vineyards located over old flood deposits consisting of coarse sandy beds and draining calcareous soils. On this soil Podere Sapaio cultivates Cabernet Sauvignon, Cabernet Franc, Merlot, and Petit Verdot. One of the fundamental points of the Sapaio philosophy is respect for the land and a sustainable approach that effectively combines technology and tradition.